Attend regular training sessions – it seems obvious but attending regular sessions will keep the child’s fitness levels high and help them focus. Encouragement – Encourage and support your child to enjoy their swimming, as your child will only succeed if they are enjoying themselves. Have Fun – We promote a team environment with an emphasis on hardwork, discipline and most importantly having fun. This will encourage your child to discover themselves and develop a positive self image. 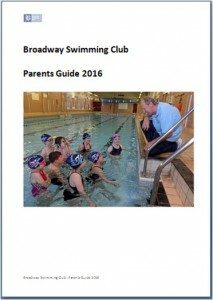 Broadway Swimming Club has created this handy Parents Guide, which contains a lot of useful information.